The Dodge brand we know today began building automobiles in 1915, and became a part of Chrysler Corporation in 1928. In the 100 years since Dodge began churning out cars and trucks, a good number of highly memorable vehicles have graced the marque’s showrooms. Even the most casual industry observer has heard of—and can likely identify—such models as the Dart, Polara, Aries, and Intrepid. But how many folks remember the 4-cylinder, Mitsubishi-built Challenger of the late Seventies? 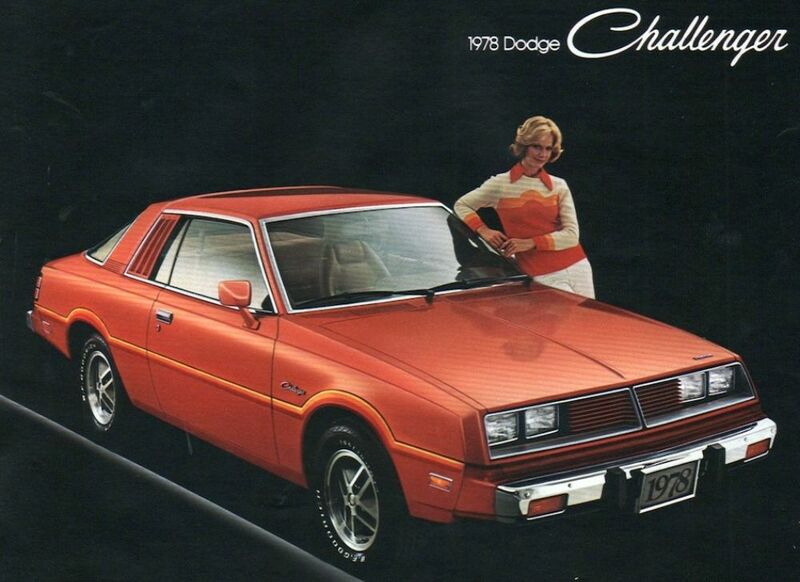 Presented here are five Dodge models you may have forgotten, or at least not thought about in a long time. A name as cool as Matador deserved a longer run. Applied to a new lower-trim-level version of the large Dodge cars, the Matador was intended to fill the price gap between those models and shorter Dart models. Available in sedan, hardtop coupe and sedan, and wagon body styles, the Matador series racked up almost 28,000 sales; a seemingly solid performance, but not enough to keep it in the lineup. Instead Dodge dropped Matador for 1961, opting instead to pull the Dart lineup slightly upmarket. An orphan in the truest sense, these Mitsubishi-built small coupes are never mentioned by Dodge PR types when discussing the Challenger legacy. A pity, as most period reviews suggest that they were actually fine automobiles. Equipped with Mitsubishi’s balance-shafted “MCA Jet” 2.6-liter engine, the Challenger was quick by contemporary standards, and reportedly nimble as well. Also available was the nearly identical Plymouth Sapporo. Looking for something a little upmarket of the Aries, Dodge rolled out the 400, an Aries clone sporting an extra dose of luxury for an extra dose of cash. 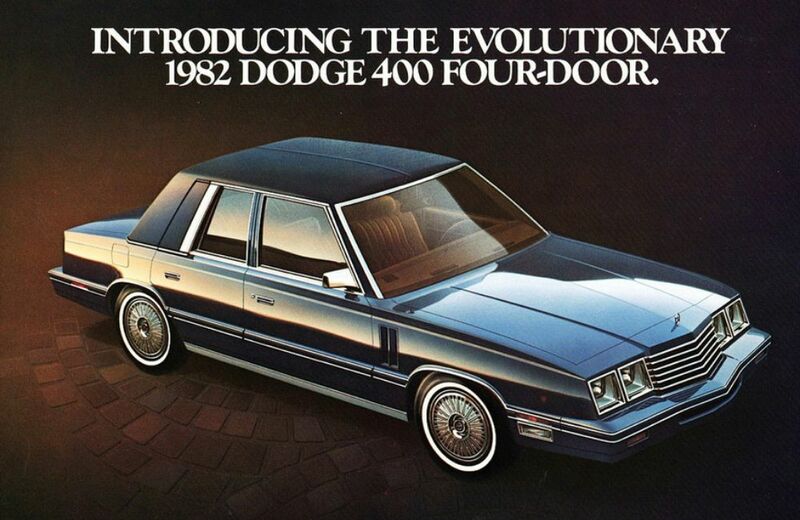 The 400 was available in 2-door, 4-door, and convertible body styles. Though the 400 was short lived, the convertible would soldier on for a few more years under the 600 banner. Like the Challenger, this generation Charger is oft overlooked in discussions of the nameplate’s history. Mechanically identical to the Plymouth Turismo and closely related to the Dodge Omni and Plymouth Horizon, the Charger shared its basic architecture with the French designed and built Simca Horizon. Simca came under Chrysler control in 1970. 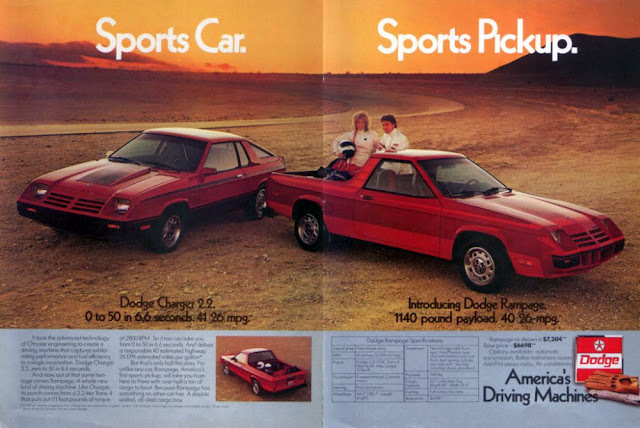 The short-lived Rampage pickup accommodated two passengers but was otherwise mechanically similar to the Charger. Plymouth sold a clone of the Rampage dubbed Scamp. Responding to increasing consumer interest in small SUVs, Dodge turned to Mitsubishi for a turn-key solution to its showroom needs. 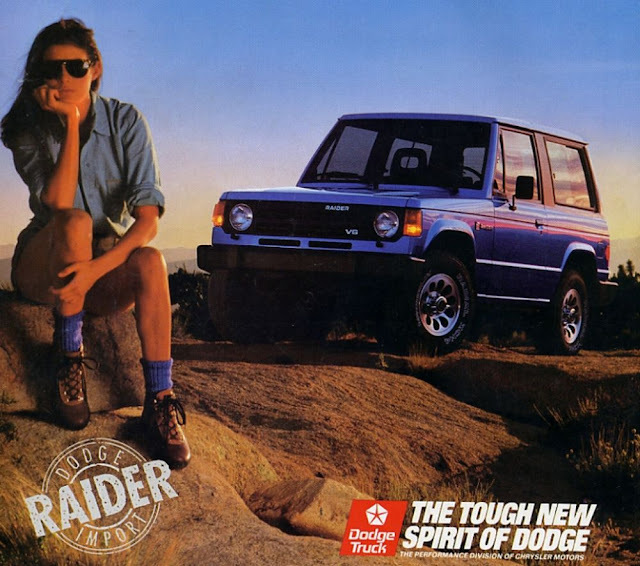 The Raider was a quickly cloned version of Mitsubishi’s Montero truck, though it never sold as well as the original vehicle.